Yesterday, I visited the home of new clients. The couple moved to Montgomery from Albuquerque, New Mexico a while back and recently decided to construct a swimming pool in their back yard. My father was from New Mexico, and we had much to talk about. The newly excavated pool space and the resulting mounds of dirt, combined with this heat and drought, reminded us all of the New Mexico landscape. Our conversation turned to what we can do to prevent this temporary mirage from becoming a reality. If you are getting tired of dragging garden hoses and sprinklers around the yard every few days, or even hours, there is an economical solution, far short of installing a custom irrigation system. 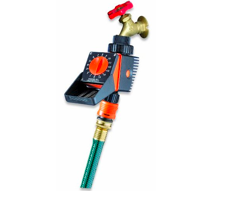 A hose timer can be added to your outdoor water faucet for under $50.00. A hose timer has several settings which will turn on your sprinkler without you having to be there! Hose timers are available at EWING IRRIGATION, 5890 Monticello Drive. They carry the Calber 8444 Logica hose end timer, which is the one I often use for my clients and myself. A nine-volt battery operates the clock. 1) Do not use the timer in the winter, when freezing conditions occur. 2) Check your faucet for leaks before buying a hose timer. If your faucet leaks, you cannot connect the timer, because it requires an open faucet valve at all times. It is the timer that controls the flow of water. If you still need a hose for hand watering and clean up, buy a hose splitter and put your timer on one side. Each side has its own control valve, so the main faucet valve can remain fully open for the timer while you operate the secondary hose as needed. Hose timers are also great for watering potted plants when you go on a trip. For more information, simply google hose timers, and get ready to be less stressed about your garden in this drought. Your plants will be less stressed, too. Mark Montoya, the Practical Gardener, is a Montgomery native who first learned gardening from his father. He has designed, planted and nurtured gardens in our city’s neighborhoods — both old and new – for twenty years. 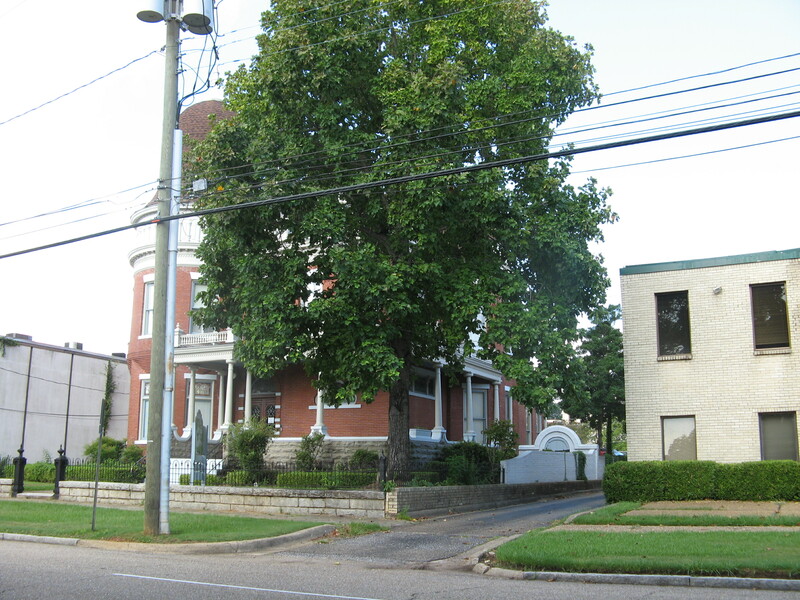 Montgomery will be THE HOT spot for historic preservation October 7 through the 9th. We will be the host city for the Alabama Trust for Historic Preservation and the Alabama Historical Commission annual statewide conference Preserving Alabama’s Hometowns, Embracing Historic Places—Making Life Better. The focus of this year’s conference is to showcase historic preservation as a tool in creating a vital, cultural, economic, and tourism core for downtown Montgomery as well as preserving and reclaiming our historic neighborhoods in which to live. The keynote speaker will be Donovan Rypkema, an internationally noted expert on using historic preservation as an economic development tool. Another track, Preservation and the Decorative Arts, will focus on living with fine art, artifacts and their care and conservation. A few highlights that Montgomery Midtowners might especially be interested in are listed below. How to live with our old stuff (antiques)- a presentation and discussion about 19th century Alabama-made furniture and imports. Wooden window restoration workshop demonstrating how to improve energy efficiency and maintaining important materials and features of our old windows. An informative walk through two of our midtown historic neighborhoods, Cottage Hill and Old Cloverdale. A panel discussion with historic neighborhood planners and residents of these neighborhoods from across the state talking about what works and what doesn’t. Networking with other old house enthusiasts at lunch in Rescued Relics at Old Alabama Town. How to preserve your family papers, images and artifacts. And of great note and fanfare, our own David Braly and Mark Montoya, of Midtown Montgomery Living, will be receiving an Alabama Trust For Historic Preservation Rehabilitation Award for their exemplary rehabilitation of Fire House #9 on South McDonough Street in the Garden District. They will be showcasing the Fire House on Thursday evening 7:30 until 9:30 for Fire and Ice Soiree, a fundraiser for the ATHP. Katherine and David Rees on Galena Avenue in Old Cloverdale have also graciously volunteered their lovely home and formal gardens for Moonlight Garden and Candlelight Dinner Party as a fundraiser for the ATHP on Friday evening at 7:30. 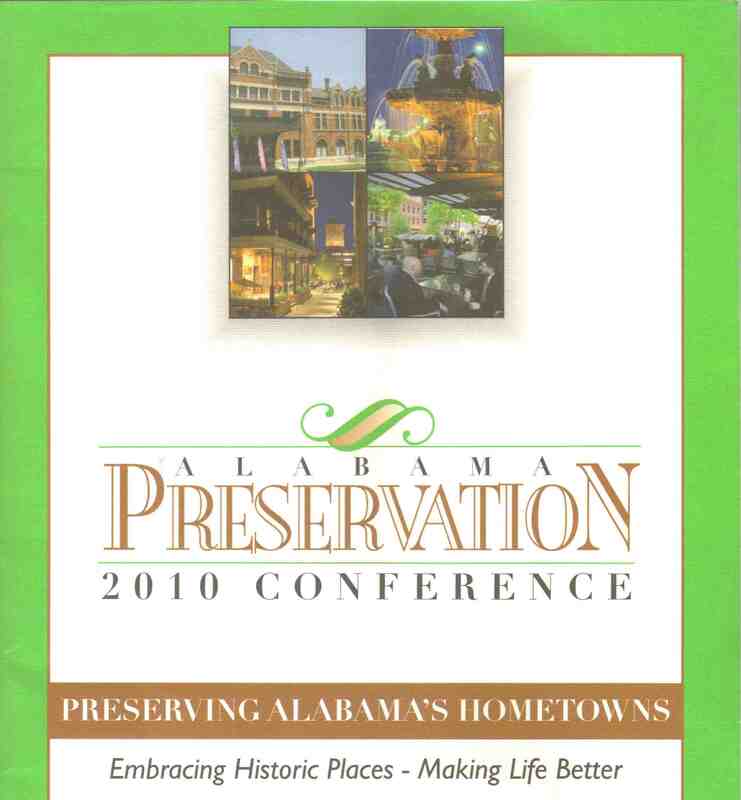 (Have you gotten the idea yet that lots of folks in Montgomery support the Alabama Trust for Historic Preservation?) Built in 1906, the home is graced with antiques and art and guests can enjoy dining in this 1906 house and meandering through its Lime Gardens with ornamental iron work, brick terraces and a dance pavilion. For a complete listing of all the offerings of this conference and for registration options so you won’t miss anything go to www.alabamatrust.info or call 205-652-3497. Many activities, including registration, are centered at the Alabama Department of Archives and History. Katherine and David Rees (who are gluttons for punishment but yet so generous to share) will also open their fabulous home and gardens for the Friends of the Alabama Governor’s Mansion fundraiser on Saturday afternoon from 3:00 until 6:00. Call 334-233-8595 for ticket information. How can any Montgomery Midtowner ever say there is nothing to do in Montgomery? Carole King (not the singer, just the hummer) enjoys midtown living from South Capitol Parkway in Capitol Heights where she has lived for 25+years. Carole has been the historic properties curator for the Landmarks Foundation that manages Old Alabama Town for 28 years and is passionate about neighborhoods, their architectural character, their people, and their preservation! They started showing up shortly after 8 a.m. last Saturday. As the morning progressed, the land in front of the old Cloverdale School building gradually was covered over by RVs, trucks and cars. And out of the vehicles came grills, coolers, lawn furniture and canopies. 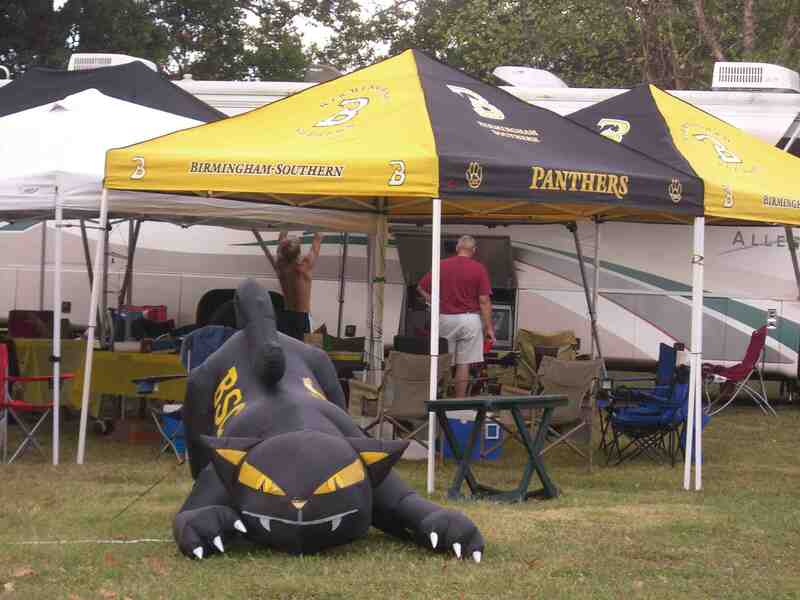 Fans of Huntingdon football and their homecoming rival, Birmingham Southern, were participating in one of the South’s favorite rituals: tailgating. In the not-too-distant future, Alabama State Hornet fans will be able to enjoy the same spectator sport. In a brief interview on Friday, September 24, ASU President William Harris confirmed that ASU will be constructing an on-campus stadium. “We have the land available. We have the site picked out,” he said. Trustees are in the process now of preparing bond documents to support the project. Hearing this good news from Alabama State brought to mind the construction already underway on the eastern edge of the campus, an area formerly known as Bel Aire. To enable future expansion, the University had between 1995 and 2000 acquired all of the property between University Boulevard and the west side of Forest Avenue. Not all of the acquisition went smoothly. Some of the land was bought from homeowners, but a significant number of properties were acquired through the process of eminent domain. The recently deceased African-American District Judge Charles S. Conley owned many parcels wanted by the University and actually sued, alleging that officials had discriminated racially in their offers of compensation. When I first noted activity on the Bel Aire land this spring, I telephoned University spokesman Ken Mullinax to learn if it might herald the coming of the much-discussed football stadium and was disappointed to learn that there were other plans for that area of the campus. The recent news of a stadium site is exciting, and I’m sure welcomed by alums who want to join the ranks of Southerners who are able to make game days really special. It will be interesting to see if folks living near the ASU campus are equally happy about the planned addition. For reasons I don’t understand, I have heard some say that an on-campus stadium is not a good idea and that play should continue at Cramton Bowl. It will also be interesting to see where Huntingdon tailgaters go when the Cloverdale School frontage, now being offered for sale by owner Colonial Properties, changes hands and is developed. Were there not a fire station on East Fairview, it might make sense to just close the street on game days and allow the party to occur in the roadway. As that is not an option, I suppose only time will tell. Sandra Nickel has been listing and selling residential real estate for over 29 years, most with an intense focus on Montgomery’s Midtown neighborhoods. Sandra serves on the Mid-Alabama Coalition for the Homeless, the Cloverdale Business Coalition, Historic Southview, the Volunteer and Information Center, Landmarks Foundation and her own neighborhood Garden District Preservation Association. Time and events coincided to turn the interest of American architecture away from the excesses of the Victorian Era and toward the country’s historical roots. In 1876 our country celebrated its centennial with celebrations and commemorations all over the country. If you were alive in 1976, you probably remember “Bicentennial Fever” sweeping the nation in much the same way. The Centennial Exhibition in Philadelphia helped focus national attention on American technology and decorative arts. One of its exhibits, a colonial kitchen with costumed interpreters, sparked larger interest in the colonial home. Decorative features like moldings, Palladian windows and columns of a more classical style began to migrate onto the irregular house forms we associate with the Victorians. At a glance these houses don’t appear to have anything to do with our Colonial beginnings. As the style developed, houses began to have more in common with our Federal and Georgian roots. Montgomery was wild for the Colonial Revival. Important houses like the Teague House and the House of Mayors on Perry Street underwent significant alterations to bring them up to date. The House of Mayors lost its wrap-around porch and gained a classical entrance and some beautiful leaded glass in designs. The severe Greek Revival of the Teague house got a fancy sheet metal cornice and door surround (tap on it–it’s hollow!). The Griel mansion on South Lawrence Street, which was Italianate, lost its tower and gained afull-blown porch. Residents raced to keep houses up to date. Montgomery’s newest residential areas, Capitol Heights, Cloverdale and the southern extensions of Court, Perry, Lawrence, Hull and Decatur that we now call the Garden District are also replete with examples of the style. In Capitol Heights, Colonial Revival shows its face in both grand and modest ways up and down Madison Avenue and South Capitol Parkway. In the Garden District, the shape of the Queen Anne house persists on the northeast corner of Hull and Clanton, but the porch has round Doric columns and both the porch and eave moldings have dentil blocks and brackets. Just down on the next corner is a full-blown Colonial Revival with a very flat facade and beautifully proportioned entry and central Palladian window. In Cloverdale, Felder Avenue examples form a graceful sweep of substantial Colonial Revival on one of Montgomery’s most beautiful residential streets. 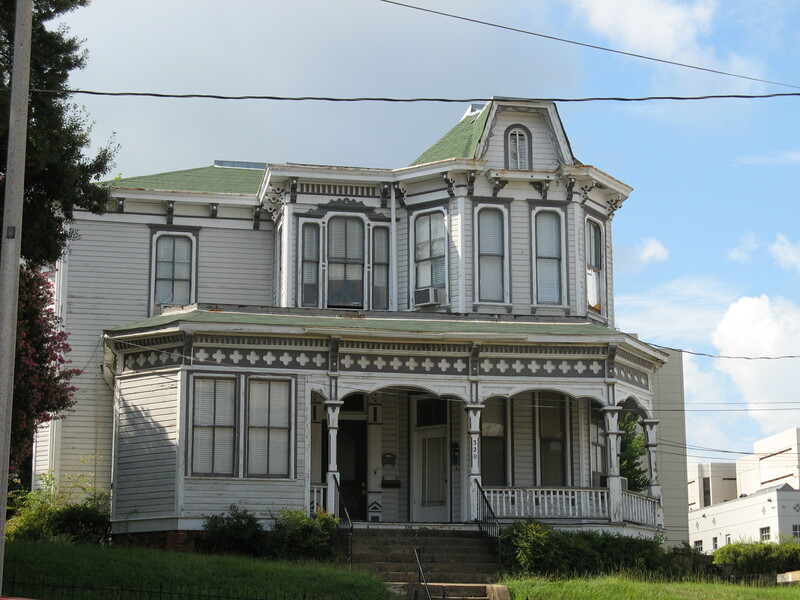 The overall shape is Victorian, but this house has acquired dentils and brackets on the eaves, and Doric columns on the porch. Almost a perfect example of early Colonial Revival, this house started life as a Queen Anne with a wrap-around porch. The brick end walls are an Atlantic coast convention, where they would also have had massive chimneys. The parapet that rises above the plane of the roof gives the cottage a neat appearance. At home in any New England state, this Cape Cod cottage with a picket fence also graces Graham Street comfortably. Still maintaining the Victorian asymetrical plan, this Madison Avenue beauty has a colonial revival porch. 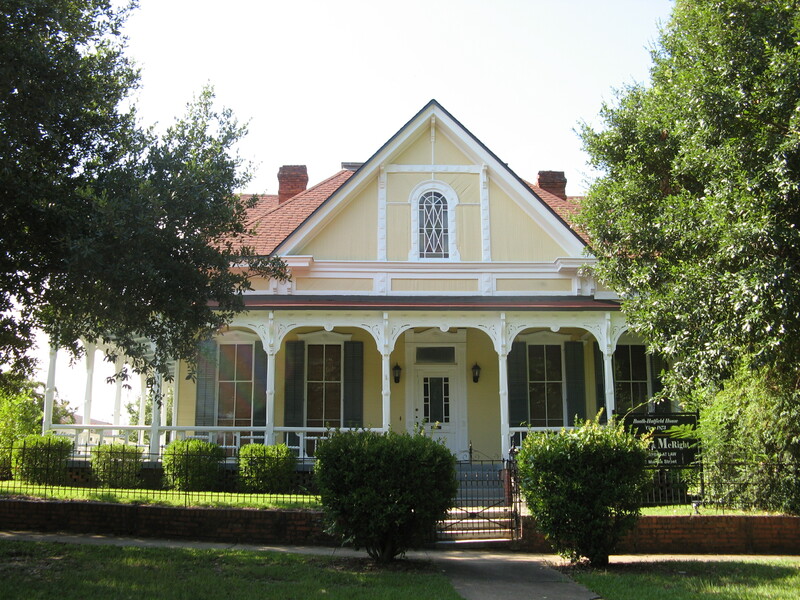 Felder Avenue shows us porch after comfortable porch, all full of Colonial Revival detail. With only a brief side trip into some other styles, Colonial Revival has been the most popular and enduring stylistic language of residential architecture in our country. It was very popular in the catalogues of mail-order houses like Sears and Aladdin. Books about these mail-order houses are a good way to study the breadth of the style. One of my favorites is Houses by Mail, by Katherine Stevenson and Ward Jandl. Any of the staff at Capitol Book and News can order it for you, or you can get a copy used on the on-line book sites like Alibris or ABE books. Elizabeth Ann Brown has lived in and loved Montgomery’s Garden District for more than twenty years. She holds a Bachelor of Architecture and a masters degree in Community Planning from Auburn University. Her hobbies include pursuit of the ultimate chicken salad sandwich, bicycling, and working on her old house, a 1913 bungalow. How’s the Market? It All Depends! A severe buyers’ market means prices are extremely negotiable and may be falling. In Midtown Montgomery, it means in general that only those really needing to sell should be on the market because buyers expect and are getting discounts on sales prices and many other give-backs with dollar signs attached. So how’s the market? Taken as a whole, Midtown is still pretty much tough sledding for sellers. Overall, we see 11.01 months of homes available for sale. That means in theory that if no additional homes go on the market, it will take just over 11 months for all the existing listings to be sold. 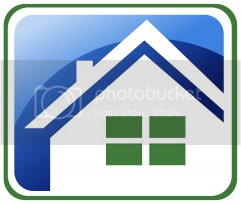 The good news is that the inventory of homes available for sale is down somewhat from last year and appears still to be declining. Let’s look at a few specifics, starting with Cloverdale-Idlewild. In the past 12 months, 13 homes were sold. And today there are exactly 13 homes on the market for sale. Clearly, there is that theoretical 12-month supply of homes, which would label Cloverdale-Idlewild a severe buyers’ market. Hillwood, however, is quite a different story. In the past 12 months, 13 homes sold in Hillwood/Hillwood West. And there are only 8 homes on the market today. In theory, it will take less than 8 months for those homes to sell, so Hillwood is a balanced market. This means that buyers won’t find the “deals” there that the national media has been telling them they should expect. If you are thinking about selling and/or buying in Midtown, be sure you have the “How’s the market…my segment of the market” conversation with your agent. Then act accordingly to avoid disappointment down the road. What a world! What a world! What a world! In this messed-up world — and this horrible drought we are in, bring yourself some joy with house plants. The green in your home will soothe your soul. Some people feel that they must wait for someone to be ill or die before they can have a beautiful house plant. I say to them, indulge! Plan to spend about fifty dollars on a variety of house plants, and they will be happier with this heat wave, living the lush life up to the holidays. I recommend a few plants that can be picked up at any home improvement store or garden center: Bromeliads, Dracena, Calathea, Orchids, Spathiphyllum, Sedums, Succulents and Sansevieria. No ferns, though, because ferns are not a house plant. On bringing the plants home, wrap the bottom of the pot with aluminum foil, then place it into an attractive container. I have used baskets, decorative bowls, and urns. For best results, place plants in a north or south window. To water, place about six ice cubes on top of the soil around the plant three times a week — it’s easier and less messy than trying to water from a can or pitcher. Don’t worry about fertilizer unless you want to spend the rest of your life with them. And, don’t stress out over the plants — enjoy them! They are meant to be an alternative to the horrible conditions in the outside world. Throw them away before they die. Just say ‘goodbye’ before the holidays begin, and you will truly enjoy your interior world for the next few months. Mark Montoya is a Montgomery native who first learned gardening from his father. He has designed, planted and nurtured gardens in our city’s neighborhoods — both old and new – for twenty years. If Bob Dylan had been alive in the 1870’s, he could have sung, “The times, they are a-changing,” to much the same effect as he did in the 1960’s and 1970’s. Times had actually already been changing before the Civil War, but as the building trades began to revive after Reconstruction, people suddenly gained access to changes in style and technology that had been scattered across the South before the war. Steam powered saw mills were everywhere, and you could now buy already-milled lumber, rather than hand-dressing your own timbers. The centuries-old braced-frame construction (which used a few large timbers) fell away as new framing systems (involving many small pieces of wood) became popular because of the availability of sawn wood. Catalogs from manufacturing centers became available, showing doors, windows, mantles, brackets, and all kinds of trim, readily available through your local hardware store and delivered by train. For the first time, materials only in the northeast were now available everywhere. While the availability of materials led to standardization of building parts, the variety of forms allowed by mechanization meant that there was an almost infinite number of parts to combine in design. You might be able to buy the same parts in Columbus, Ohio, as in Montgomery, Alabama, but they were not likely combined in quite the same way. The Queen Anne style was all the rage by the 1880’s. The name isn’t really indicative of the real Queen Anne or the Renaissance architecture that was popular during her reign, nor did it have much to do with the style called Queen Anne in Great Britain. House form took a decided turn toward the asymmetrical, with a large hip roof combining with an intersecting gable toward the front becoming a very popular style. The gable toward the street, often the whole house, became highly decorated with wood shingles, carving, half-timbering (sometimes all of them) combined to dazzling effect. If the Greek Revival was an exercise in restraint, Queen Anne was an exercise in excess. 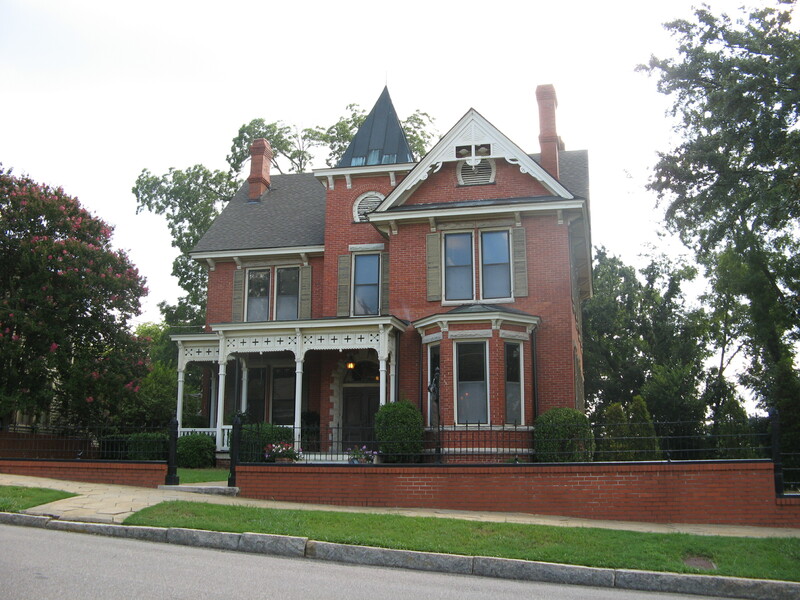 Two-story houses were popular, but one-story houses in the Queen Anne style abound in Montgomery. Brick was popular in the northeast, but except for a few notable examples, wood predominated around here. Everything about this house speaks of prosperity and an economy booming again after the deprivations of war and Reconstruction . A tower is often called out as a defining feature of Queen Anne in the guidebooks. 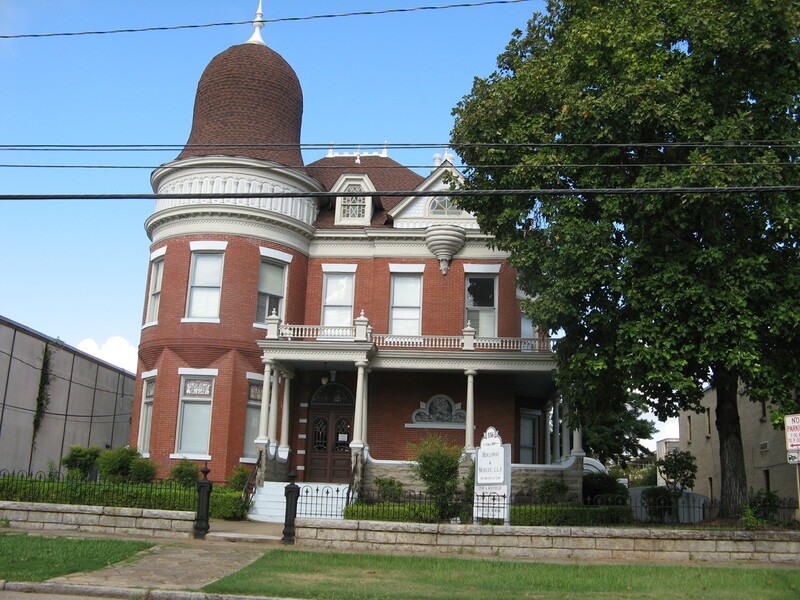 One great example here is the very high-styled Kennedy-Sims house on South Perry Street. It is brick, and has a round tower overhanging an octagonal base, rising with a frieze of lozenge-shaped wood through the main roof to a dramatically curved tower roof and finial. This tower could have graced an important street in any city in the country with ease. The details on the porch are more restrained and classical, but who needs a ginger-breaded-up porch with that tower, the stone trim, and the leaded-glass windows? At one time, Perry Street could have held its own with the “millionaire’s row” of most any prosperous American city. Sadly, many fine houses were town down in the 1960’s and replaced with buildings with little character. Unfortunately the environment of the Kennedy-Sims house is degraded by construction of unsympathetic buildings on both sides. Another towered and brick example in the neighborhood is the Stay House at 631 South McDonough. The brick forms a backdrop against which the jigsaw-cut porch and gable trim is shown to advantage. The center, square tower is engaged in the main body of the roof. One charming feature of both the tower and gable are the horseshoe-shaped ventilators, leading to a local name as the “horseshoe house.” Probably not meant to be horseshoes, these “ogee” arches with the compound Moorish curve are found in many pattern books, and are said to be representative of the “Oriental” influence. 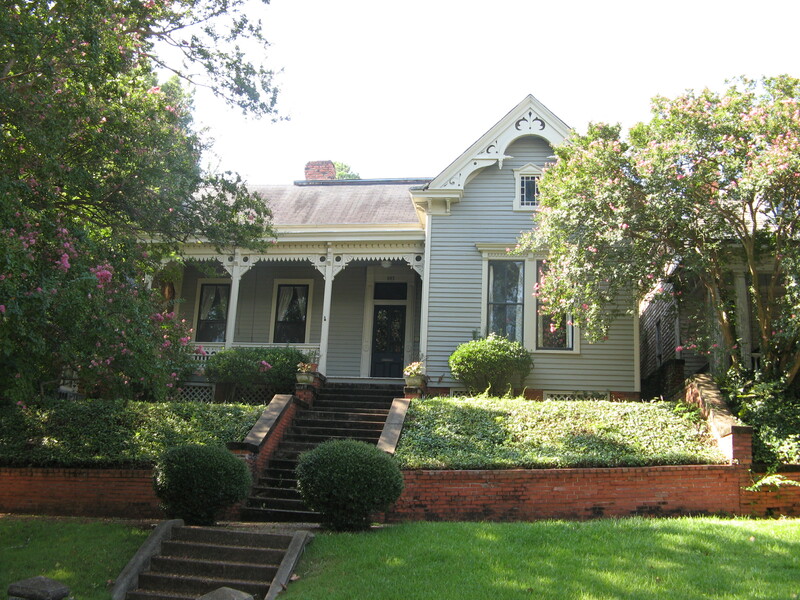 The house was built by Dr. John Hazard Henry, one of Montgomery’s early physicians. Although still replete with decoration, the Stay house presents a more restrained and dignified face to the street. The rusticated (rough) stonework is particularly nice. Although we're accustomed to the contrast between the wood trim and the house, period colors were often dark, with earth tones predominating. Although I have always thought of this house as Second Empire, now I’m not so sure. Are the curves we’re seeing on this tower actually showing the Oriental influence? 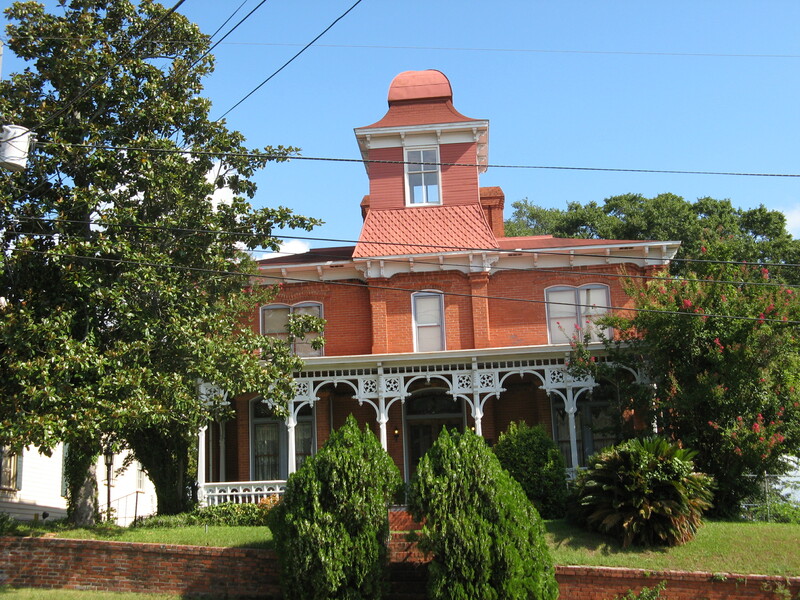 We can note more high-style examples on Perry Street , but it is in Cottage Hill that Victorian and Queen Anne flourish. A profusion of wood, cut in the most intricate of designs, lines the streets of one of Montgomery’s post-war (the Civil War, that is) housing boom areas. A drive up Martha Street shows any number of examples of vernacular Victorian Queen Anne cottages, with their asymmetrical form and lacy gingerbread decorating the porches. There may be numerous examples of the “L-shaped Victorian Cottage” in Montgomery, but their charm is only reinforced by their numbers. More popular in the northeast than in the South, we still see the influences of Stick and Shingle Style in Montgomery. Stick Style refers to larger wood members which outline areas of weatherboard or shingles, and give a sense of rectangularity to the design. These horizontal and vertical elements were often picked out in a darker color. This technique is applied to the very symmetrical house on the southwest corner of Martha and Hanrick to great effect, although the owner has chosen to paint the “sticks” white and the body of the house a rich cream. This vernacular cottage shows influence of the Stick-Style in the gable decoration, with larger white members framing areas of decorative siding, some of it installed at a 45 degree angle. The Shingle Style was popular for retreats and shore houses of the wealthy in the northeast, and I think particularly interesting because they seem to really convey a sense of the volume of space inside, rather than a composition of decorated walls. 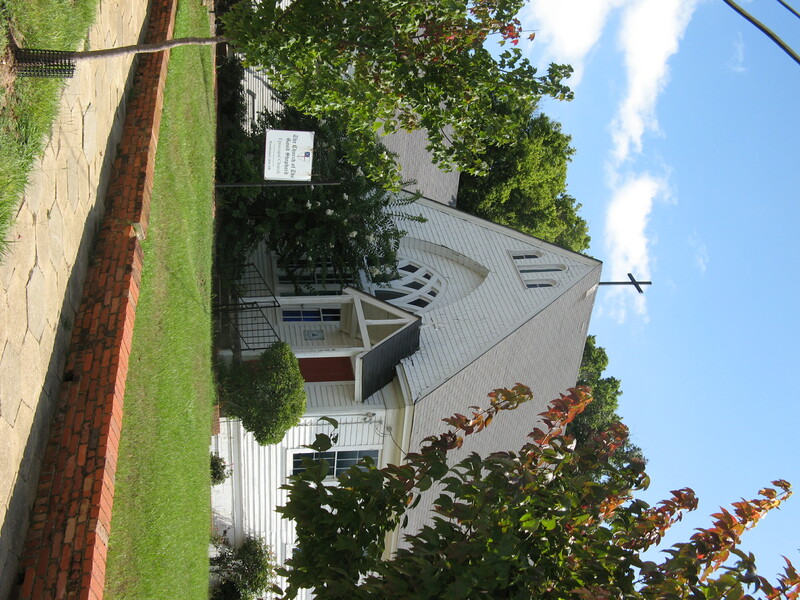 Church of the Good Shepherd on South Jackson Street in Centennial Hill is not fully Shingle Style, but the shingled gable and then recessed front with the Gothic arched window appear to be carved out of one volume, rather than being decorative elements arranged on the facade in the same way Shingle Style buildings do. Good Shepherd’s front façade decorates in a very volumetric fashion, with the gable in very high relief to the wall of the church. The composition seems to have been carved from a block of wood. Alabamians in this period continued their love of all things European, or their ideas of what they might be. Italianate continued to be fashionable, with decorative motifs like brackets, spindlework and arches moving onto the asymmetrical box that had become the current house form. One of the Dowe houses, 320 Washington Avenue, demonstrates the Victorian Italianate well. We also turned our eye to the French and adopted the curved Mansard roof of the Second Empire style, although if you judge by the number of examples we seem to have continued our romance more with the Italians than the French. The Dowe House would have felt at home on a San Francisco street, although her color scheme might be a bit subdued for that California city. Victorian styles continued well into the early decades of the 20th century. Next time we’ll talk about Colonial Revival and Neo-Classical, probably the most resilient architectural styles in our vocabulary.